Where Was God? | moms are for everyone! My wonderful husband has worked SO hard on writing the music for a hope-filled film due to release this weekend called “Where Was God?”. It follows the lives of several families affected by the tornado that plowed right through Moore, Oklahoma almost one year ago. This movie is a gut-wrenching look at what the aftermath of an event like this is truly like, and the stories of hope that arise from the rubble. A city brought low rises up again with stories to tell – stories that will build & strengthen your faith in whatever storms of life you might face. It shows how the winds intertwined more than just branches & debris – it also intertwined hearts and journeys of healing in breathtakingly beautiful and unexpected ways. It’s a story you’ll never forget. It will release locally at the Warren Theatre in Moore first, but screenings may be requested elsewhere at wherewasgod.com. Please check out the trailer below, and help spread the word in any way you can! 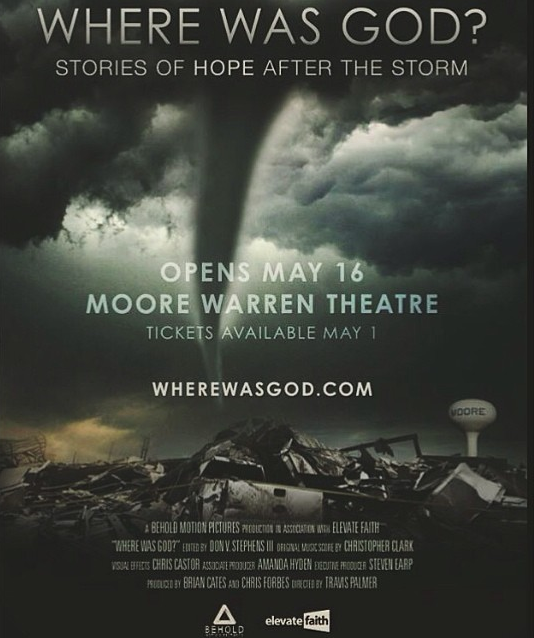 This entry was posted in Uncategorized and tagged film, moore tornado, oklahoma, warren theatre, where was god by emeryjo. Bookmark the permalink.